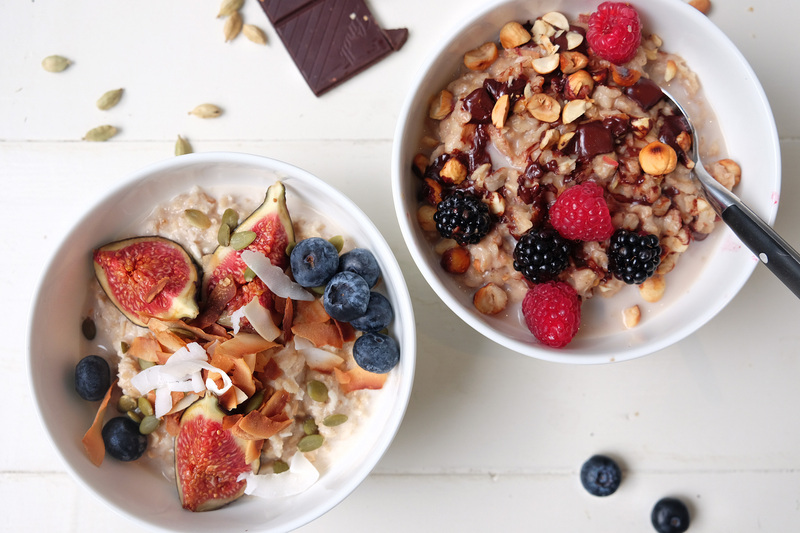 The thought of porridge when we where young filled us with fear, a lumpy grey bowl of horror, but today it has come on leaps and bounds and is actually rather fashionable, along with its summery friend the bircher muesli. Wherever you look from health food blog to an old classic cookbook you will find a version. Here we have been experimenting with lighter styles compared to the classic milk based porridge where a lot of people like to add cream and even butter. It has defiantly got to that time of year where you crave a warm, hearty breakfast and a fried egg with a couple of sausages is all well and good on a frosty morning when you are off for a good walk, but less so on the everyday commute to work. This is where porridge oats come up trumps – It has a low-GI which means it is slowly absorbed into the bloodstream which not only keeps hunger locked up till lunch, it gives a long gradual release of energy. Apparently, Bear Grills is a long-term fan, and if its good enough for him its good enough for us. It is something that is going to put you in a good mood as soon as you wake up, the thought that within the hour you will warming yourself with a bowl of creamy porridge topped with crunchy nuts, honey or fruit, what an indulgent way to start the day, and the fantastic thing is that you don’t have to feel guilty about it. The hazelnut and chocolate one is Lucy’s favorite whereas Jemima opts for the slightly more sophisticated coconut and cardamom. Nut milks are now widely available from most supermarkets, for the hazelnut we usually pick up the Rude Health label as it doesn’t have added sugar, its also actually “hazelnuty” (dreamy in a coffee). If you cant find these milks you can substitute for almond (if going to use cows milk you will want to do a ratio of 1:2 milk to water). For the first recipe, we have used gluten-free oats which cook much faster than your normal oats, if using normal increase the cooking time to approx. 10 minutes. Hazlenut, Apple and Chocolate Porridge Put 50g of oats in a small sauce pan, pour in 300ml of hazelnut milk. Simmer for 4 – 5 minutes, stirring all the time. Add the cinnamon, vanilla, and the grated apple and stir. Serve at once and sprinkle the chocolate and chopped hazelnuts over the top, and any other toppings that you want. Almond and Coconut Porridge Put the almond milk and water in a pot over a medium heat with the bashed cardamom and allow to infuse, and simmer for 5 minutes. Then sieve the mixture over a bowl, discard the cardamom. Mix oats, coconut and cardamom infused milk back into the pot and cook over a medium heat for 5 minutes, stirring. Serve at once adding your toasted coconut and almond and any fruit you may want. Delicious with maple syrup!